“Speaking to one another in psalms and hymns and spiritual songs, singing and making melody in your heart to the Lord, giving thanks always for all things to God the Father in the name of our Lord Jesus Christ” (Ephesians 5:18-20). Through music, praise and worship we celebrated the sixty-plus years of service, dedication and love for Christ that Rosie Mae Nichols Brown rendered to the music ministry at Mount Zion Lutheran Church, in New Orleans, as the organist and choir director. Members and guests honored her for her time, talents and devotion to Christ and his people as she led the adult and children’s choir, taught Sunday school, played at weddings, funerals and on any other occasion requested. She is a devoted member and has been for a long time as she attended Mount Zion Lutheran Elementary School, was confirmed and baptized Lutheran, married in the Lutheran church and assured that both her boys were baptized, and confirmed in the Lutheran faith. 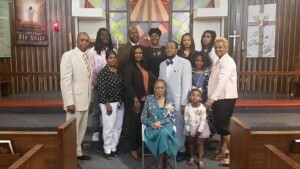 The celebration which took place after worship service on Sunday, April 10, included a tribute in which words of gratitude were shared by several members of the Mount Zion congregation. Members of the New Orleans City Council also sent letters of congratulations, in acknowledgment of this special occasion. Other highlights from the day of celebration included gifts of love and gratitude from the organizations of Mount Zion, as well as a special piece of music sung by the choir – “There Is Something About the Name ‘Jesus,'” one of Rosie’s favorite hymns.